Natural Bridge Elementary School kindergarten students scrunched up their noses as they chewed cucumber slices. The “no yuck rule” at school means they have to at least taste different fruits and vegetables. The “Veggie Brigade” is a nutrition and exercise awareness program organized by the Health Communities Action Team, a coalition to tackle childhood obesity. 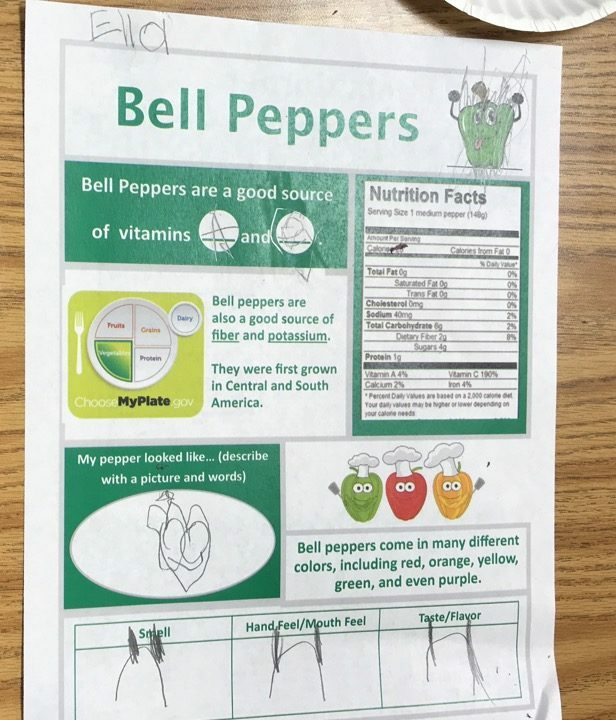 Each week the program’s staff and volunteers visit various schools throughout Rockbridge County, teaching kids about balanced diets and offering a taste of a different fruit or vegetable. The school program is in its fourth year, but it is expanding because of growing local concerns about the health of Rockbridge County residents. According to the 2018 Stonewall Jackson Hospital community needs assessment, poor diet and bad health choices ranked among the highest concerns of the community. Nearly 41 percent of survey respondents listed obesity as one of the top five health problems affecting the county. Nearly 30 percent cited poor eating habits, and lack of exercise ranked third among concerns. Annie LePere, the Parent Project and Live Healthy Rockbridge Kids Coordinator at Rockbridge Area Community Services (RACS) recalls that nutrition and exercise weren’t priorities when she grew up. Parts of Rockbridge County are classified as “food deserts” by the U.S. Department of Agriculture because residents lack easy access to sources of fresh fruit, vegetables and other healthy options. Many expect the problem to grow, especially in rural areas that lack major grocery stores.